Our Tumbled Stone Coasters make a stylish and elegant promotional statement. Great for corporate Events, Banquets, Wedding Favors, or Executive Gifts. These heavy-weight 4" x 4" natural stone coasters are made of solid snow white Marble (white stone with a smooth finish with rounded edges.) Recommended for imprints that allow the white surface to show through. Your customized 4-color process design is printed directly onto the stones for a durable imprint. Cork-backed to protect furniture. 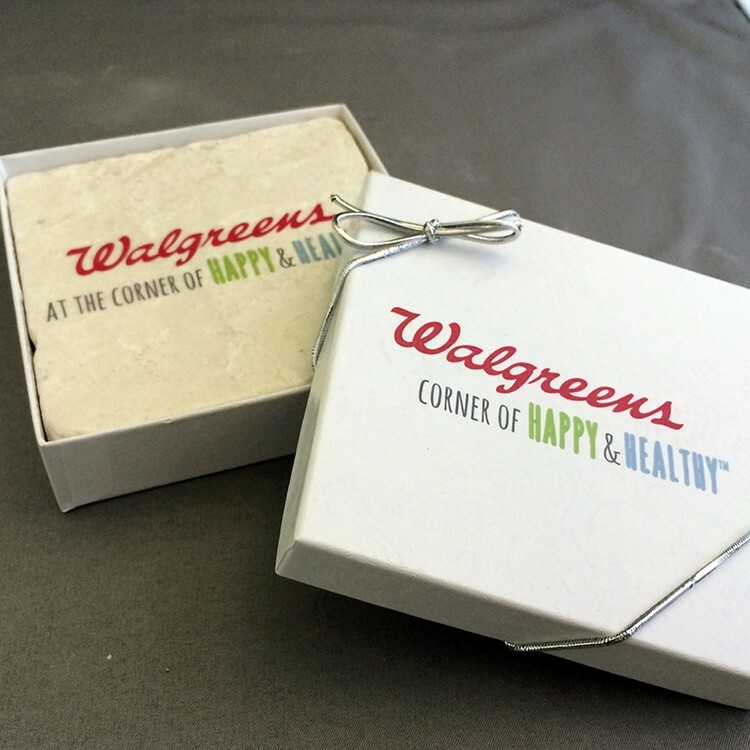 Gift-Boxed in sets of 2 in your choice of White Swirl Glossy, or Brown Kraft Matte custom printed box. 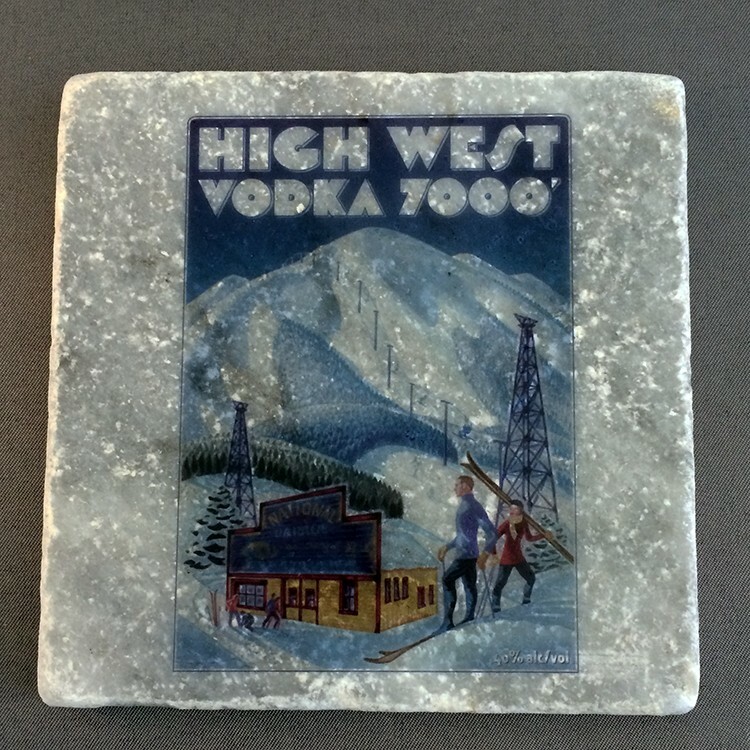 Our Tumbled Stone Coasters make a stylish and elegant promotional statement. Great for Corporate Events, Banquets, Wedding Favors, or Executive Gifts. These heavy-weight 4" x 4" natural stone coasters are made of solid Snow White Marble (white stone with a smooth finish with rounded edges.) Recommended for imprints that allow the white surface to show through. Your customized 4-color process design is printed directly onto the stone for a durable imprint. Cork-backed to protect furniture. Gift-Boxed in your choice of White Swirl Glossy or Brown Kraft Matte custom printed box. Our Tumbled Stone Coasters make a stylish and elegant promotional statement. Great for Corporate Events, Banquets, Wedding Favors, or Executive Gifts. These heavy-weight 4" x 4" natural stone coasters are made of solid Limestone (ivory stone with small flecks of brown, semi-smooth surface, unpolished finish and tumbled edges.) Cork-backed to protect furniture. Your customized 4-color process design is printed directly onto the stone for a durable imprint. Our Tumbled Stone Coaster Sets make a stylish and elegant promotional statement. Great for Corporate Events, Banquets, Wedding Favors, or Executive Gifts. These heavy-weight 4" x 4" natural stone coasters are made of solid Bluestone (darker grey stones with a smooth surface) Recommended for imprints that are darker and thicker. Your customized 4-color process design is printed directly onto the stones for a durable imprint. Cork-backed to protect furniture. 4 Coasters are gift-boxed in a custom printed, 2-piece kraft or white box (please specify white or kraft box to prevent production delays). 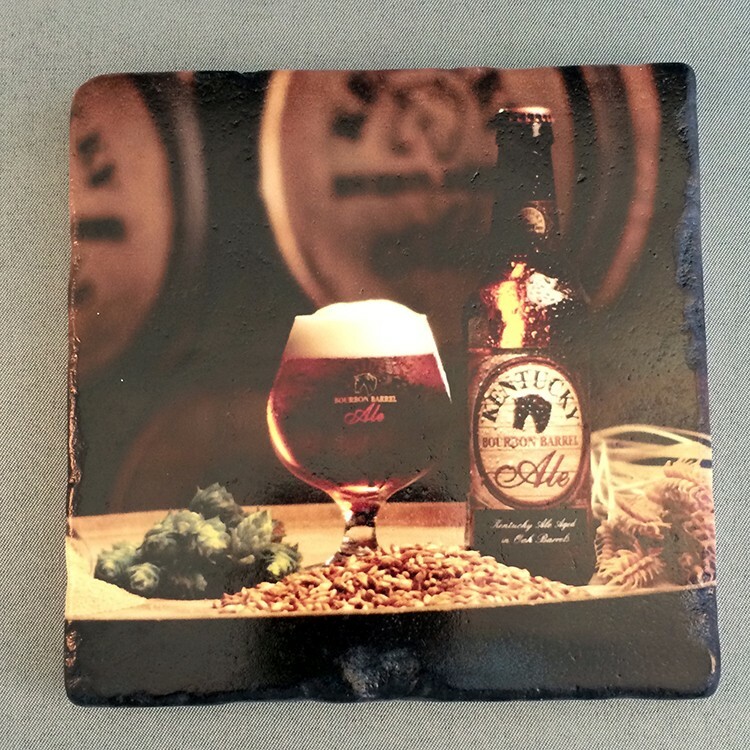 Our Tumbled Stone Coaster Sets make a stylish and elegant promotional statement. Great for Corporate Events, Banquets, Wedding Favors, or Executive Gifts. 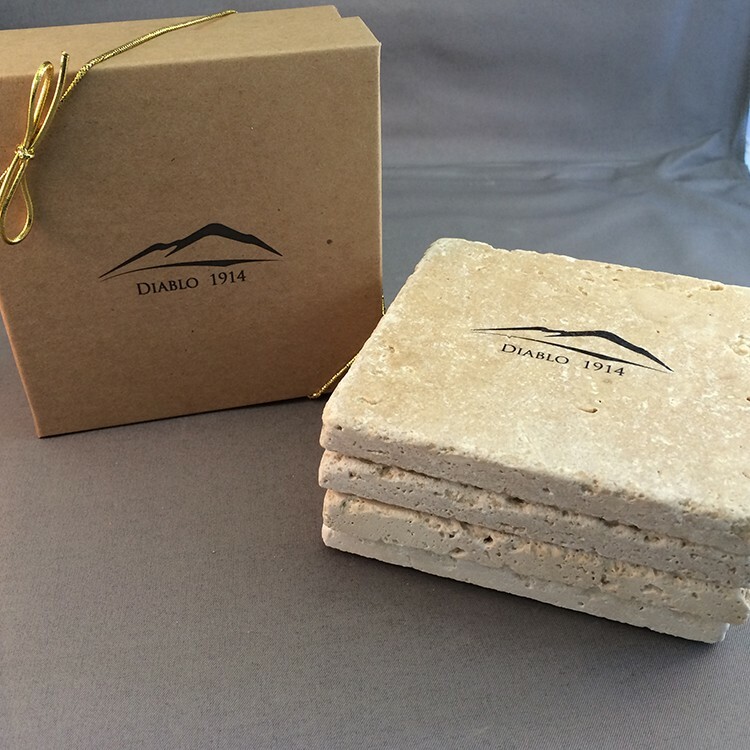 These heavy-weight 4" x 4" natural stone coasters are made of solid Tumbled Travertine (natural ivory, rough pitted finish with tumbled edges). Your customized 4-color process design is printed directly onto the stones for a durable imprint. Cork-backed to protect furniture. 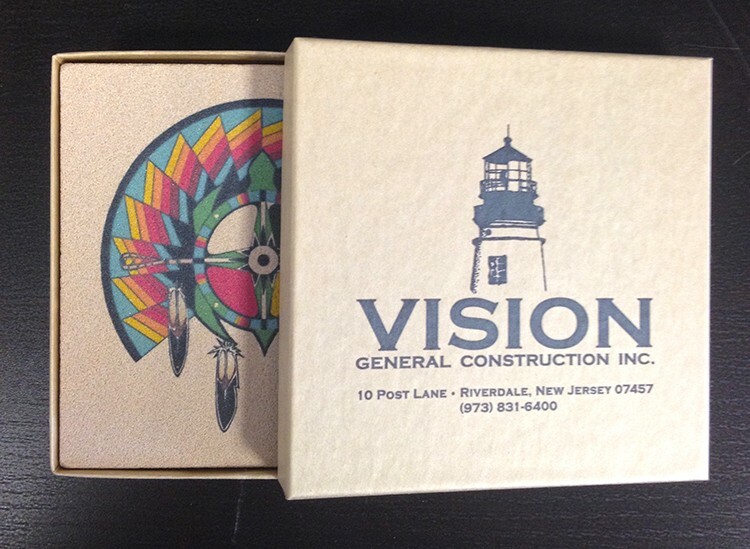 4 Coasters are gift-boxed in a custom printed, 2-piece kraft box. Our Tumbled Stone Coaster Sets make a stylish and elegant promotional statement. Great for Corporate Events, Banquets, Wedding Favors, or Executive Gifts. These heavy-weight 4" x 4" natural stone coasters are made of solid Turkish Fume - grey stone with light flecks. Your customized 4-color process design is printed directly onto the stones for a durable imprint. Cork-backed to protect furniture. 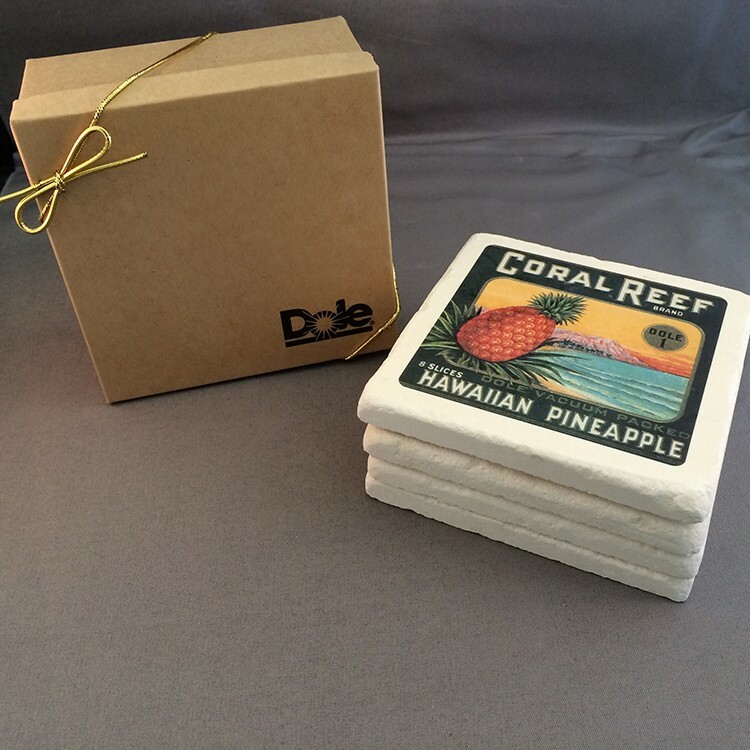 4 Coasters are gift-boxed in a custom printed, 2-piece kraft or white box. 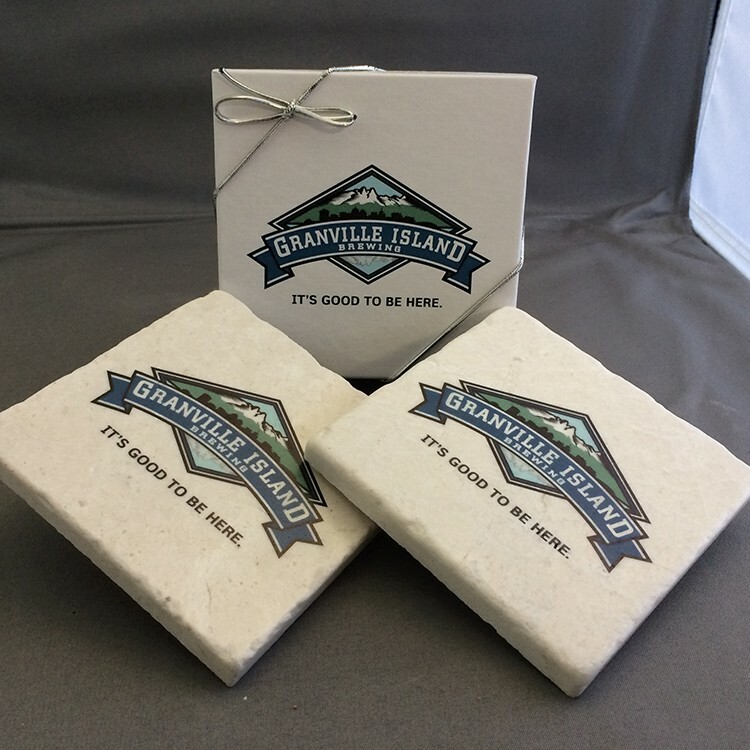 100% Natural absorbent white sandstone coasters are great for corporate events, client gifts, wineries, restaurants, hotels and souvenir shops. Cut from natural slabs of sandstone, each coaster looks like pure beach sand with little or no patterns. Your customized 4-color process design is printed directly onto the stone for a permanent, durable imprint. Also available in gift sets (see item #s SSWC1BX, SSWC2BX and SSWC4BX). 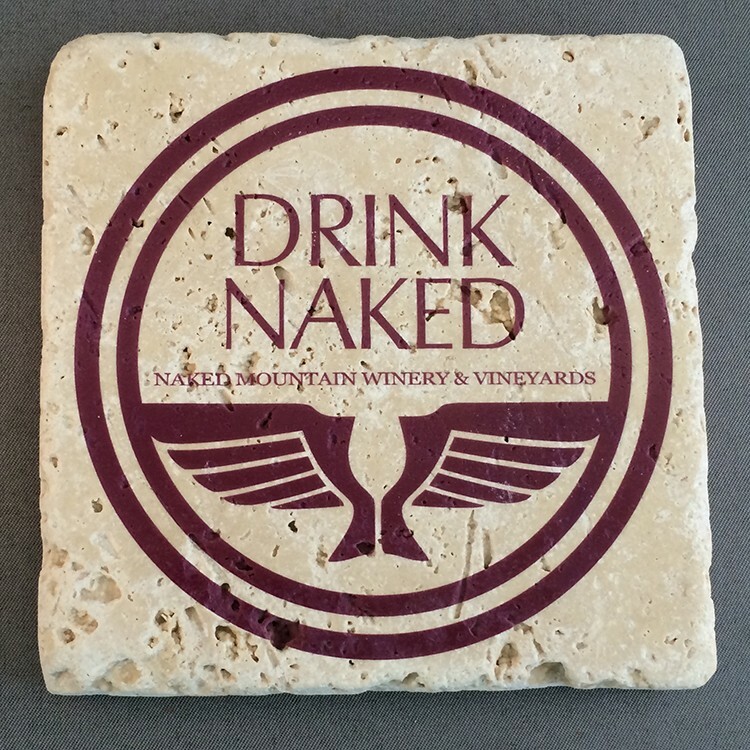 100% Natural absorbent sandstone coasters are great for corporate events, client gifts, wineries, restaurants, hotels and souvenir shops. Cut from natural slabs of sandstone, each coaster looks like pure smooth beach sand with little to no grain or variation on the surface. Your customized 4-color process design is printed directly onto the stone for a permanent, durable imprint. Comes in a custom printed gift box (choice of brown kraft or white swirl). 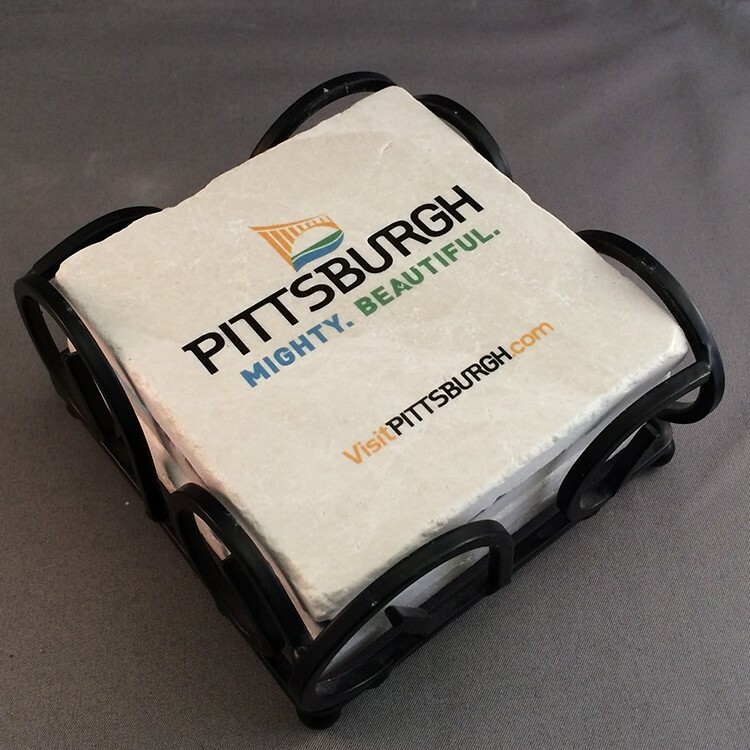 100% Natural absorbent sandstone coasters are great for corporate events, client gifts, wineries, restaurants, hotels and souvenir shops. Cut from natural slabs of sandstone, each coaster has unique natural patterns and variations. Your customized 4-color process design is printed directly onto the stone for a permanent, durable imprint. Also available in gift sets (see item #s RSSC1BX, RSSC2BX and RSSC4BX or WIRSSC4 with a wrought iron holder). 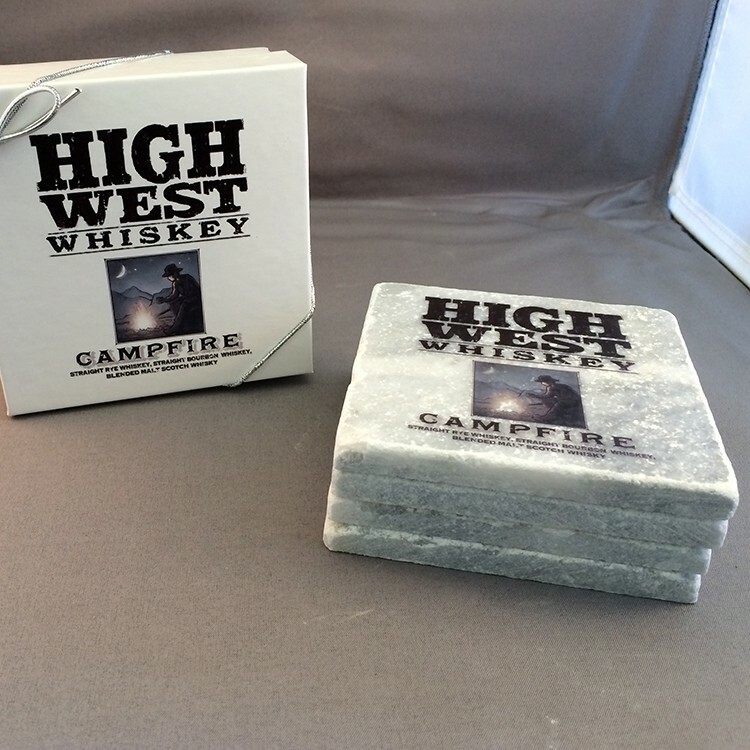 100% Natural absorbent sandstone coasters are great for corporate events, client gifts, wineries, restaurants, hotels and souvenir shops. Cut from natural slabs of sandstone, each coaster has unique natural patterns and variations. Your customized 4-color process design is printed directly onto the stone for a permanent, durable imprint. Comes in a custom printed gift box (choice of brown kraft or white swirl). 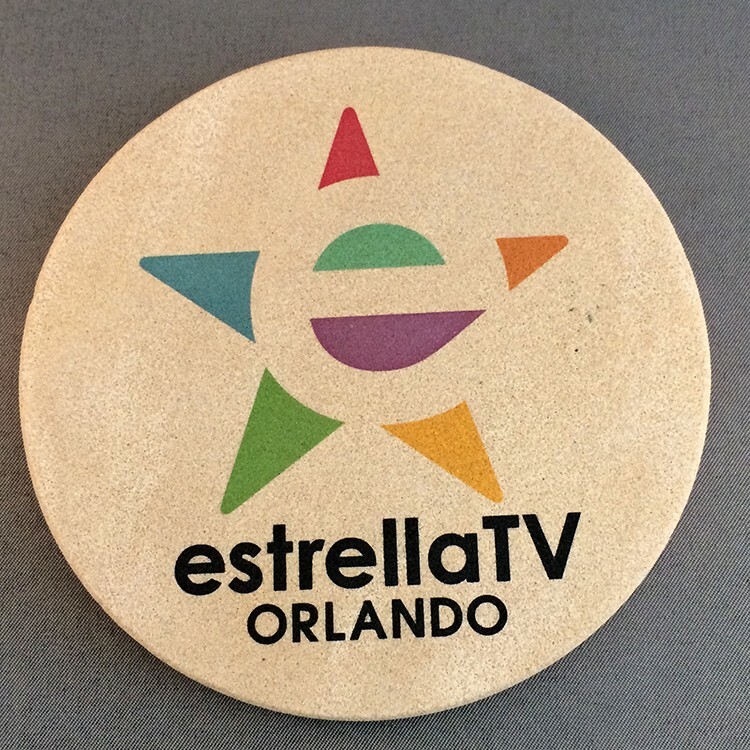 Our Tumbled Stone Coasters make a stylish and elegant promotional statement. Great for Corporate Events, Banquets, Wedding Favors, or Executive Gifts. These heavy-weight 4" x 4" natural stone coasters are made of solid Tumbled Travertine treated with a white-primer spray to provide a brighter surface for photo imprints. Your customized 4-color process design is printed directly onto the stone for a durable imprint. Cork-backed to protect furniture. 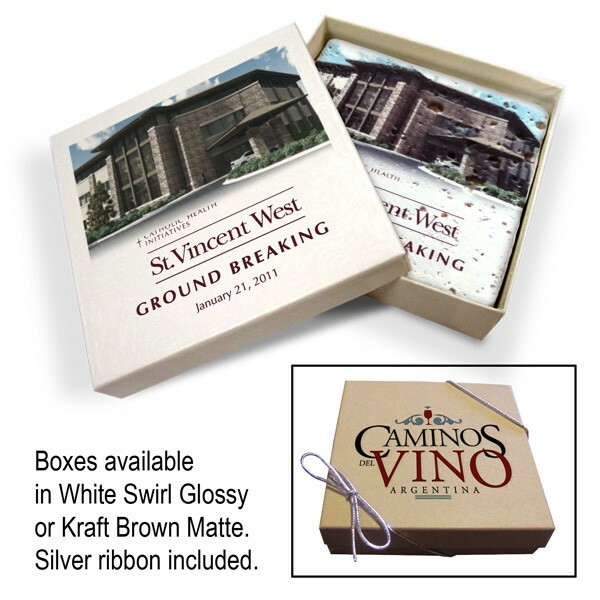 Gift-Boxed in your choice of White Swirl Glossy, or Brown Kraft Matte custom printed box with Silver Ribbon closure. 100% Natural absorbent sandstone coasters are great for corporate events, client gifts, wineries, restaurants, hotels and souvenir shops. Cut from natural slabs of sandstone, each coaster has unique natural patterns and variations. Your customized 4-color process design is printed directly onto the stones for a permanent, durable imprint. 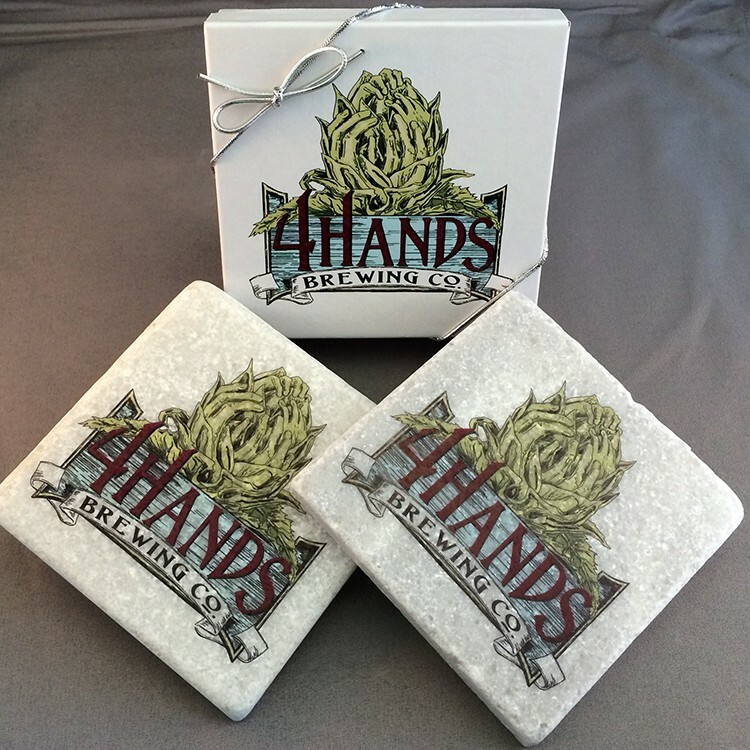 Sets of 4 are packaged in a custom printed kraft gift box. 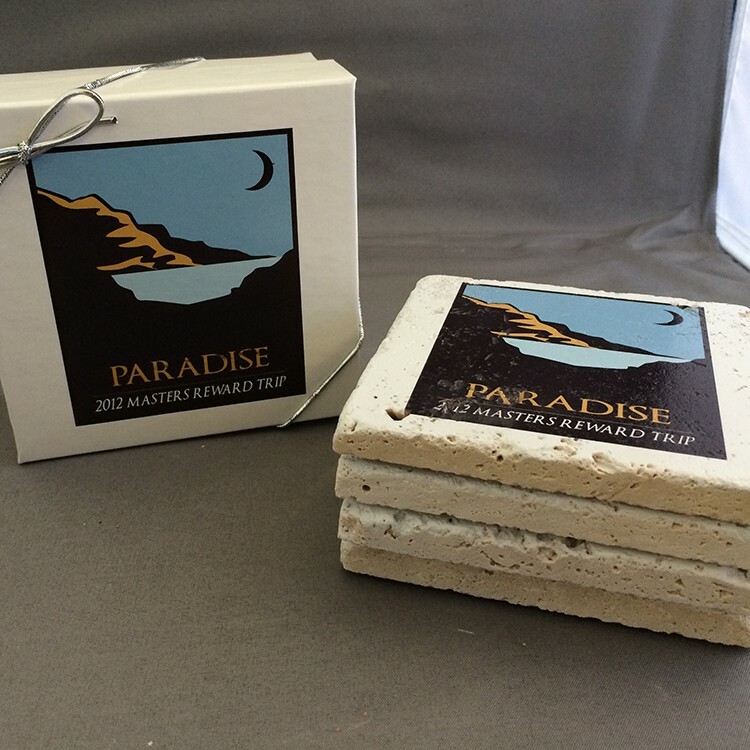 100% Natural absorbent sandstone coasters are great for corporate events, client gifts, wineries, restaurants, hotels and souvenir shops. Cut from natural slabs of sandstone, each coaster has unique natural patterns and variations. Your customized 4-color process design is printed directly onto the stones for a permanent, durable imprint. Set of 2 comes in a custom printed gift box (choice of brown kraft or white swirl) with silver ribbon closure. Our Bluestone Tumbled Stone Coasters are dark grey in color but have a very smooth surface. This Turkish stone is darker than the Fume stone and best for dark logos or solid black images. These 4" x 4" natural stone coasters are made of Bluestone direct from Turkey (with a cork backing to protect furniture). Your customized 4-color process design is printed directly onto the stone for a durable imprint. 100% Solid Natural Stone Set of 4 Coasters in a beautiful Wrought Iron-finish holder. 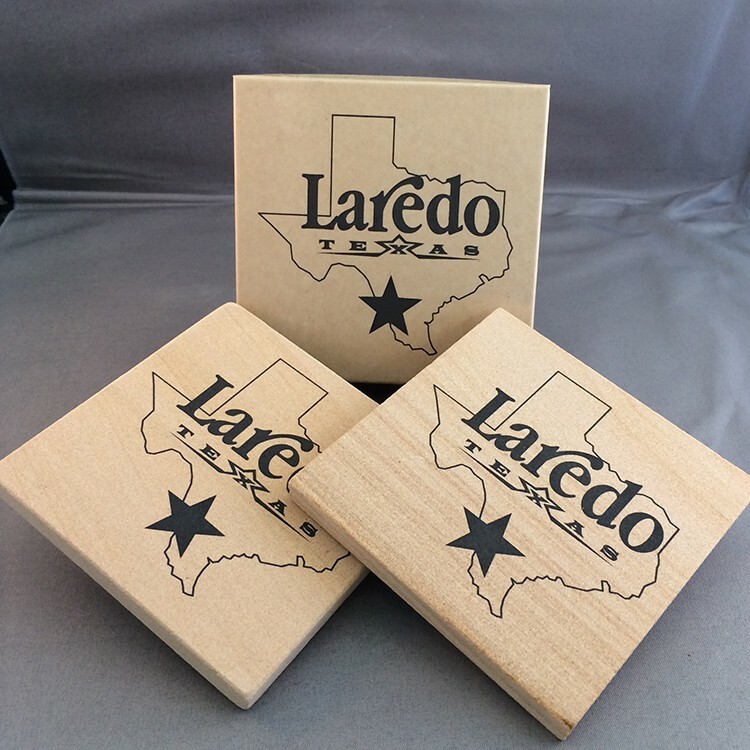 4" x 4" stone coasters are made of solid Travertine (holes, defects, the stones are VERY natural looking and best for fat logos and thick lines). These stones are pre sprayed with a white primer to allow for maximum vibrancy in printing. Your customized full color design is printed directly on to each stone for a durable imprint. Coasters are cork-backed to protect furniture. Coasters are packaged inside wrought iron holder and boxed. Our Tumbled Stone Coasters make a stylish and elegant promotional statement. Great for Corporate Events, Banquets, Wedding Favors, or Executive Gifts. These heavy-weight 4" x 4" natural stone coasters are made of solid Italian Botticino Marble treated with a white primer spray to provide a brighter more uniform surface for photo imprints. Your customized 4-color process design is printed directly onto the stones for a durable imprint. Cork-backed to protect furniture. Gift-Boxed in sets of 2 in your choice of White Swirl Glossy, or Brown Kraft Matte custom printed box. 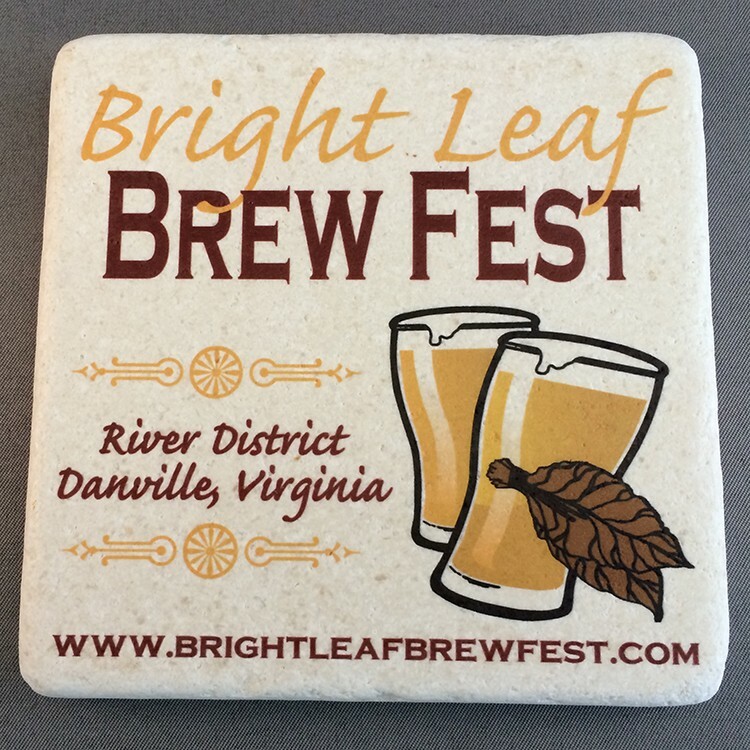 100% Natural round absorbent sandstone coasters are great for corporate events, client gifts, wineries, restaurants, hotels and souvenir shops. Cut from natural slabs of sandstone, each coaster has unique natural patterns and variations. Your customized 4-color process design is printed directly onto the stones for a permanent, durable imprint. 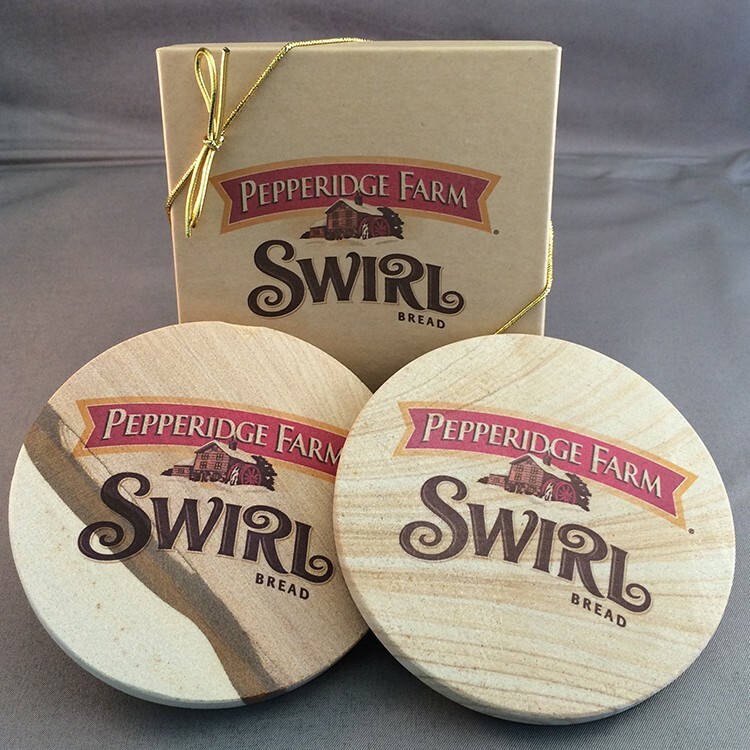 Set of 2 comes in a custom printed gift box (choice of brown kraft or white swirl). 100% Solid Absorbent Sandstone Set of 4 Round Coasters in a beautiful wrough iron-finish holder. 4" Round stone coasters are made of solid slabs of natural Sandstone (absorbent surface with earthtoned natural patterns and variations). Your customized full color design is printed directly on to each stone for a durable imprint. Coasters are cork-backed to protect furniture. Coasters are packaged inside wrought iron holder and boxed. 100% Solid Bluestone Set of 4 Coasters in a beautiful wrough iron-finish holder. 4" x 4" stone coasters are made of solid slabs of Turkish Bluestone (darker grey with very smooth surface - light inks don't show up well so darker images are best). Your customized full color design is printed directly on to each stone for a durable imprint. Coasters are cork-backed to protect furniture. 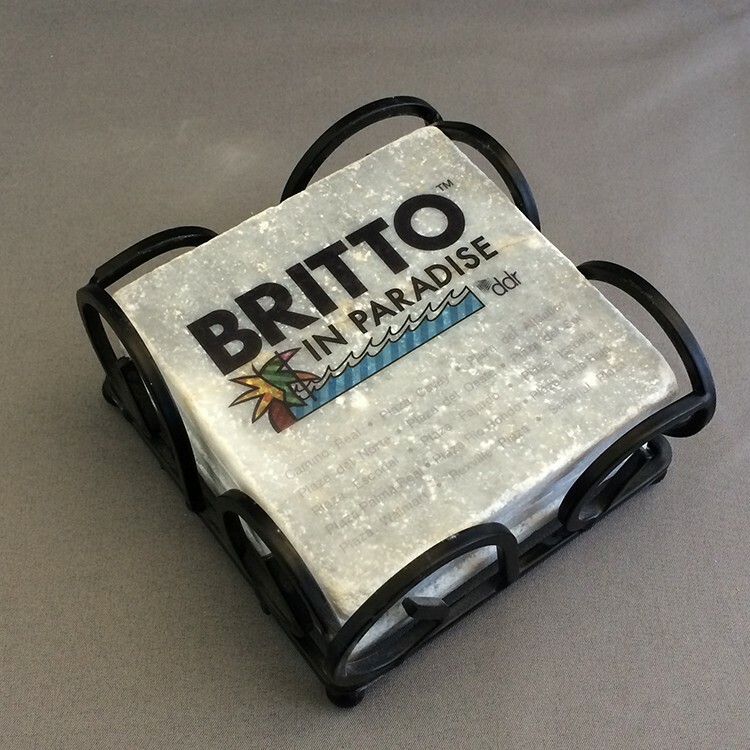 Coasters are packaged inside metal wrought-iron-looking holder and boxed. 100% Solid Natural Stone Set of 4 Coasters in a beautiful wrought iron holder. 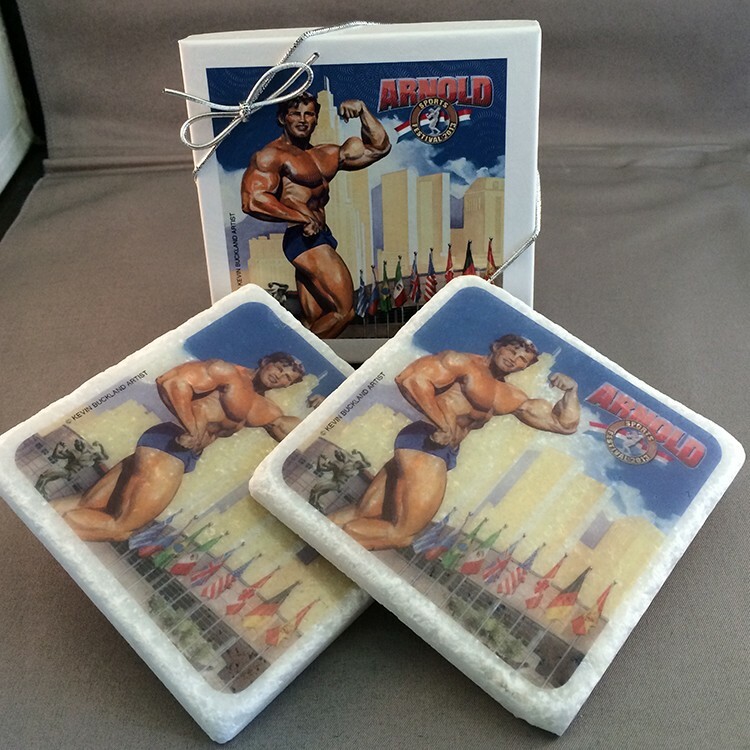 4" x 4" stone coasters are made of solid Snow White Marble (white stone with a smooth finish and rounded edges.). Your customized full color design is printed directly on to each stone for a durable imprint. Coasters are cork-backed to protect furniture. 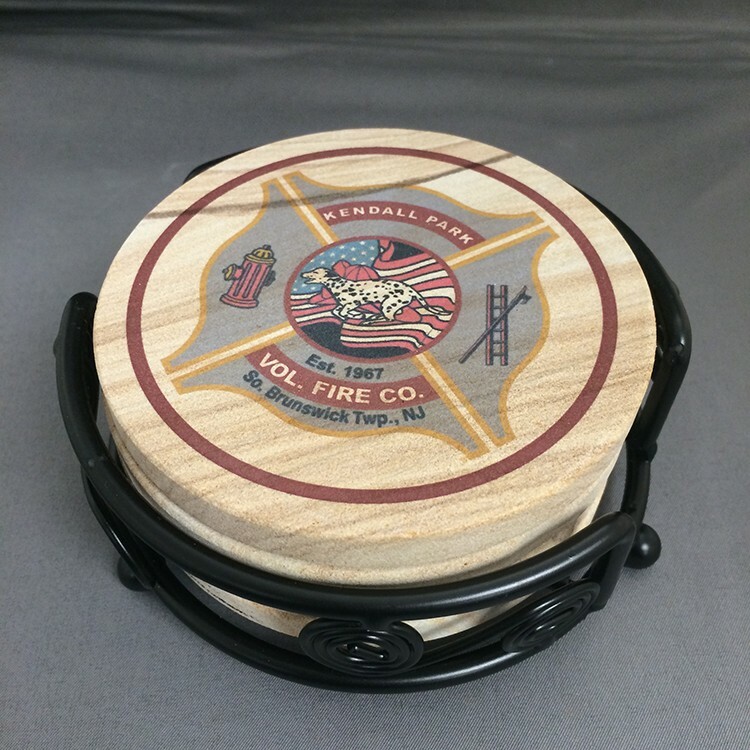 Coasters are packaged inside wrought iron holder and boxed. 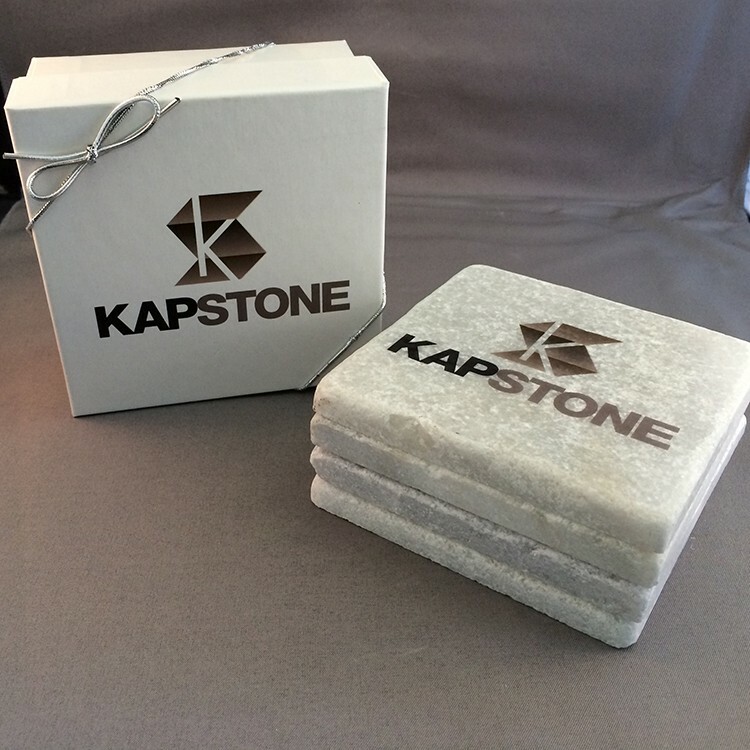 Our Tumbled Stone Coasters make a stylish and elegant promotional statement. Great for Corporate Events, Banquets, Wedding Favors, or Executive Gifts. These heavy-weight 4" x 4" natural stone coasters are made of solid Tumbled Travertine (natural ivory, rough pitted finish with tumbled edges). Cork-backed to protect furniture. Your customized 4-color process design is printed directly onto the stone for a durable imprint. 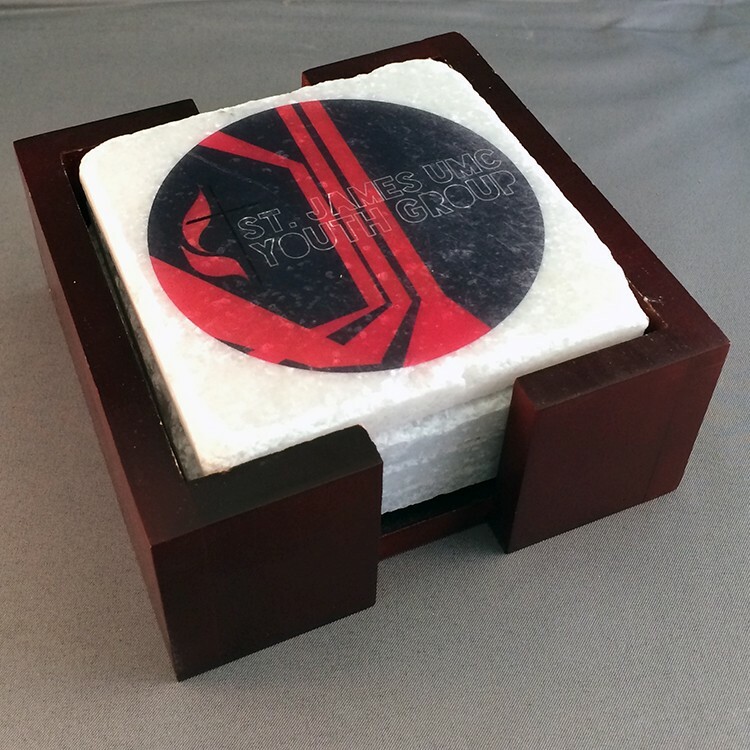 Our Tumbled Stone Coasters make a stylish and elegant promotional statement. Great for Corporate Events, Banquets, Wedding Favors, or Executive Gifts. 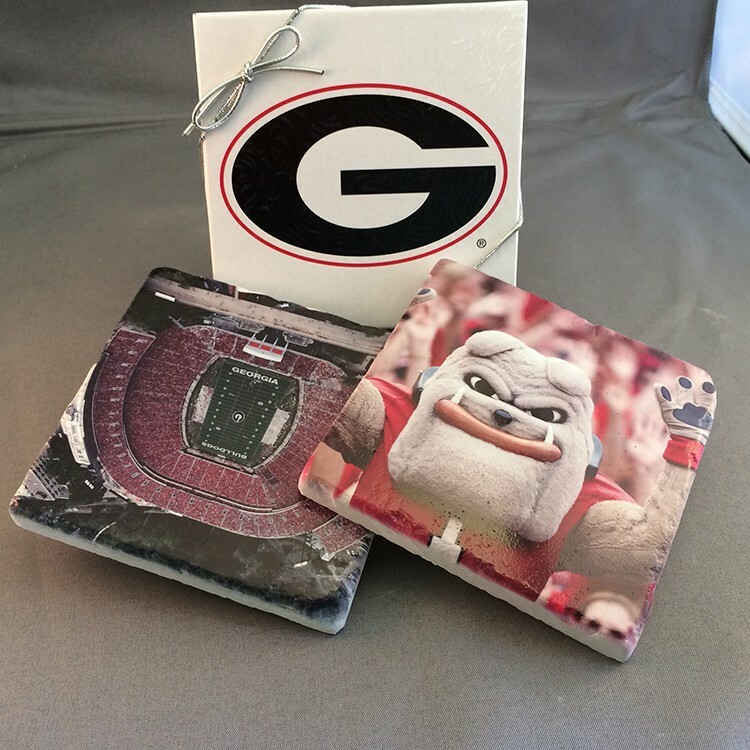 These heavy-weight 4" x 4" natural stone coasters are made of solid Tumbled Travertine treated with a white primer spray which enhances photographic images and creates a brighter, more uniform surface for your 4-color process imprint. RECOMMENDED FOR FULL BLEED IMPRINTS. (See item # TC100 for natural travertine finish). Cork-backed to protect furniture. 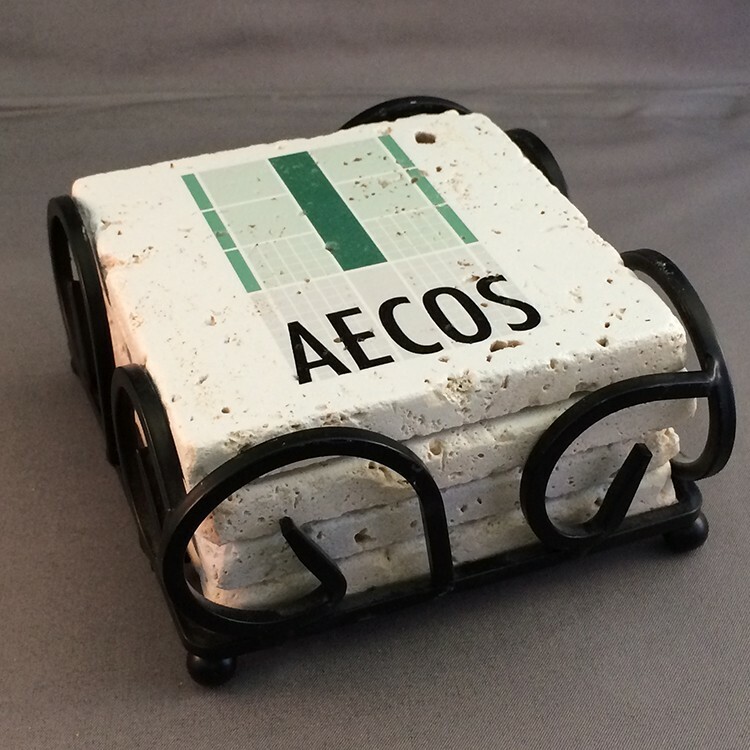 Our Tumbled Stone Coasters make a stylish and elegant promotional statement. Great for corporate Events, Banquets, Wedding Favors, or Executive Gifts. These heavy-weight 4" x 4" natural stone coasters are made of solid Sparkling Marble (white stone with shimmering crystals that sparkle at different angles. Smooth finish with rounded edges.) Recommended for imprints that allow the sparkling surface to show through. Your customized 4-color process design is printed directly onto the stones for a durable imprint. Cork-backed to protect furniture. Gift-Boxed in sets of 2 in your choice of White Swirl Glossy, or Brown Kraft Matte custom printed box with Silver Ribbon closure. 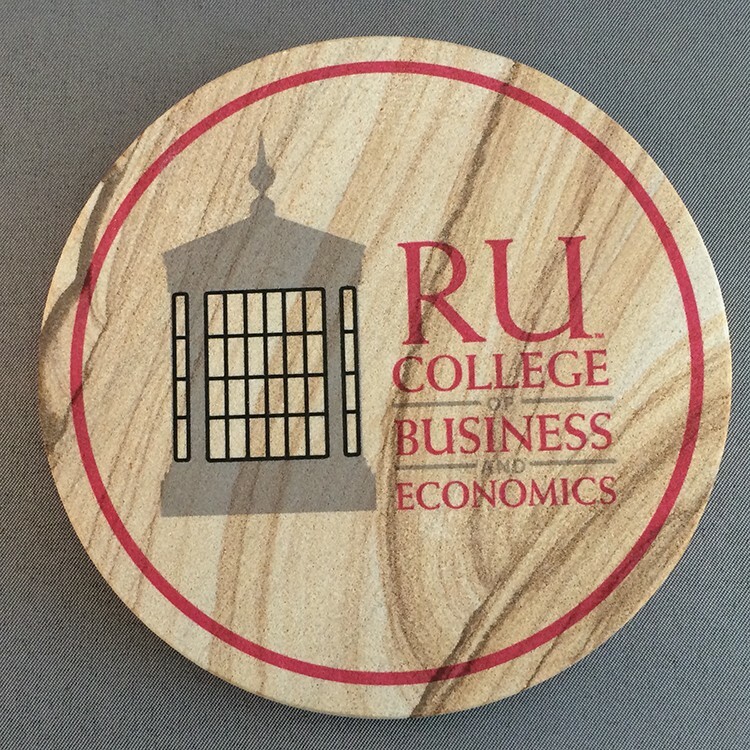 Our Tumbled Stone Coasters make a stylish and elegant promotional statement. Great for Corporate Events, Banquets, Wedding Favors, or Executive Gifts. 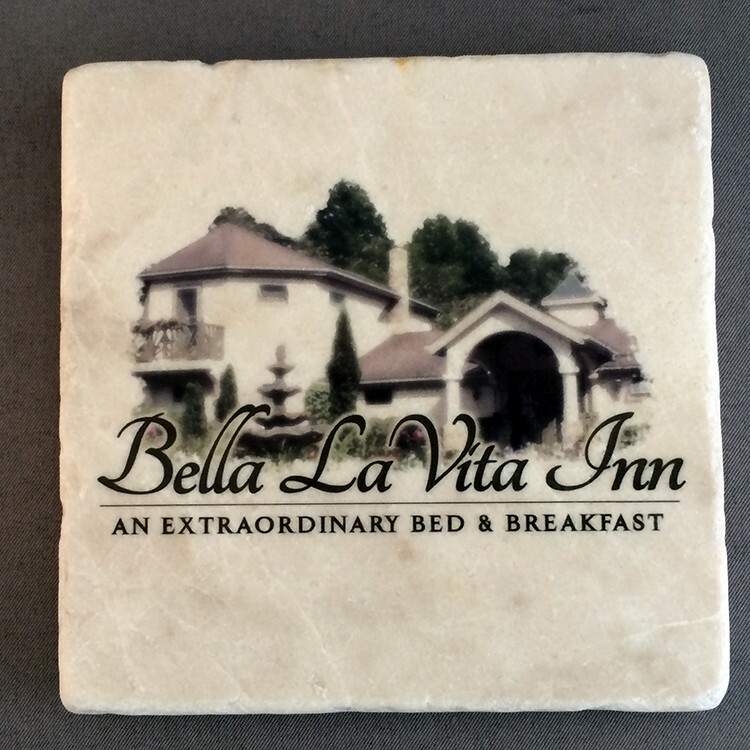 These heavy-weight 4" x 4" natural stone coasters are made of solid Italian Botticino Tumbled Marble treated with a white primer spray which enhances photographic images and creates a brighter, more uniform surface for your 4-color process imprint. RECOMMENDED FOR FULL BLEED IMPRINTS. (See item # MC100 for natural marble finish). Cork-backed to protect furniture. 100% Solid Natural Stone Set of 4 Coasters in a beautiful Mahogany-finish holder. 4" x 4" stone coasters are made of solid Sparkling Marble (white stone with shimmering crystals that sparkle at different angles. Smooth finish with rounded edges.). Your customized full color design is printed directly on to each stone for a durable imprint. Coasters are cork-backed to protect furniture. 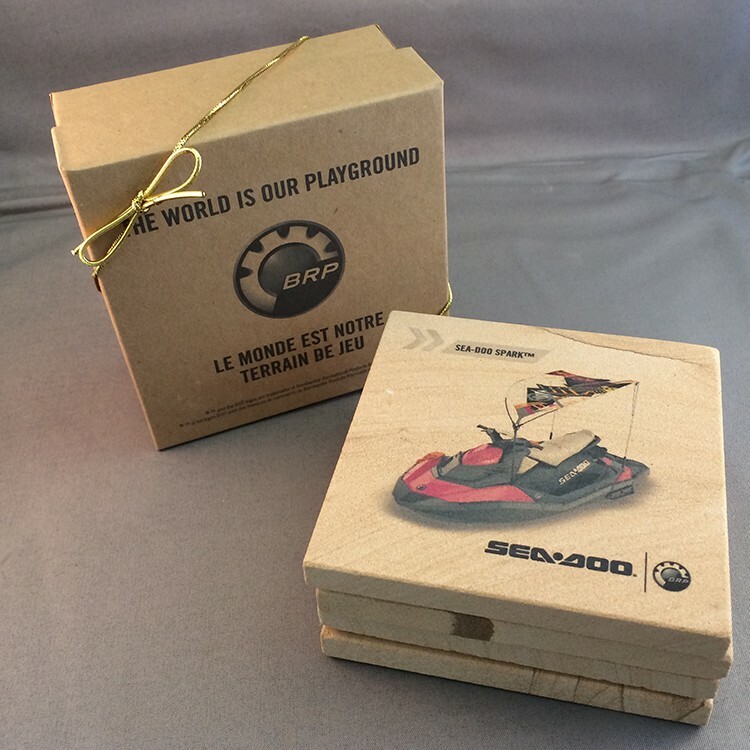 Coasters are packaged inside Mahogany holder and boxed. 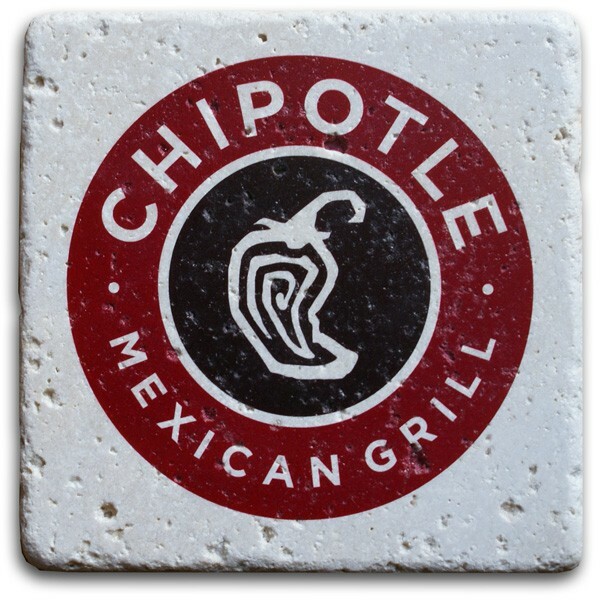 Our Tumbled Stone Coaster Sets make a stylish and elegant promotional statement. Great for Corporate Events, Banquets, Wedding Favors, or Executive Gifts. These heavy-weight 4" x 4" natural stone coasters are made of solid Tumbled Travertine (rough pitted finish with tumbled edges), primed with a white primer spray to enhance photographic images. RECOMMENDED FOR FULL BLEED IMPRINTS. (See Item # TC100- SET for our Natural Travertine finish.) Your customized 4-color process design is printed directly onto the stones for a durable imprint. Cork-backed to protect furniture. 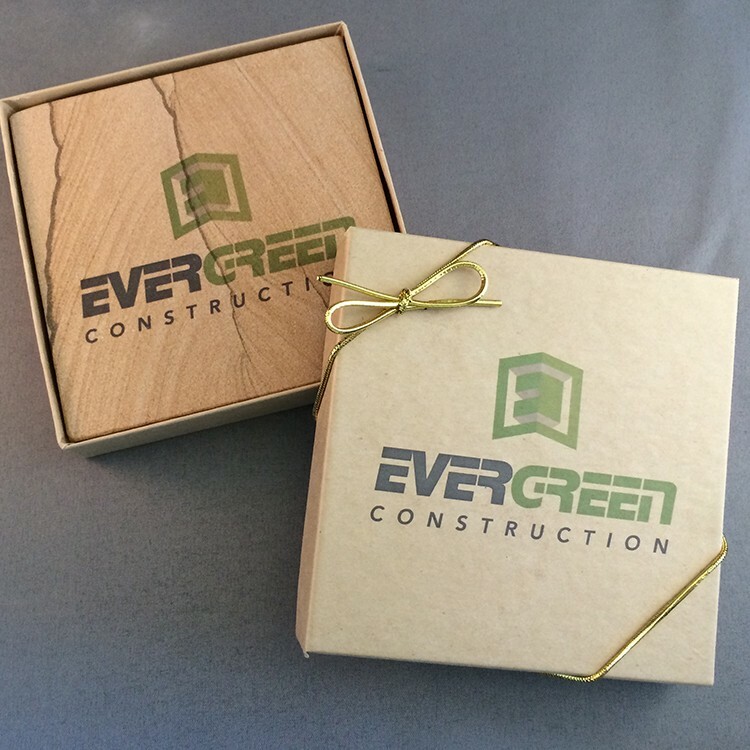 4 Coasters are gift-boxed in a custom printed, 2-piece kraft box. 100% Solid Absorbent White Sandstone Set of 4 Coasters in a beautiful wrought iron-finish holder. 4" x 4" stone coasters are made of solid slabs of natural Sandstone (absorbent surface smooth coloring - looks like beach sand). Your customized full color design is printed directly on to each stone for a durable imprint. Coasters are cork-backed to protect furniture. 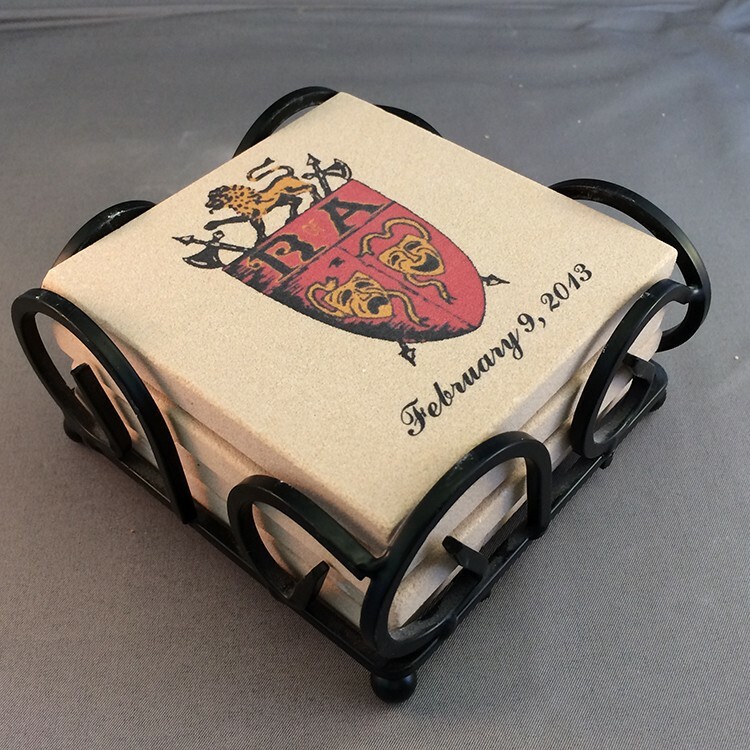 Coasters are packaged inside wrought iron holder and boxed.